Comfortable new-built detached village house, a few minutes from Hesdin town center and at a walking distance from shops, including on the groundfloor: entrance hall, living/dining room with French windows leading onto the garden (28m²), fitted kitchen (11.5m²), 1 bedroom, wc. Upstairs: 3 bedrooms, bathroom. Garage, electric heating, PVC double-glazing windows. Set on about 500m² of land with nice private garden. Prices from 183000€! Independent WC, room used as storage with attic. Private entrance hall for access to the appartment. lounge of 16 m² with fireplace, bedroom of 11 m². On 2nd floor : 2 bedrooms of 10 m² and 11 m², shower room comprising shower, washbasin and WC. Wooden modern house comprising 5 bedrooms and 2 bathrooms. Land of about 1 acre. 2 bedrooms of 12 m² and 9 m², Shower room with shower and washbasin, separate toilet. Attached to the house : garage with attic for storage. Canche Valley, 5mn driving from Hesdin, quiet location. Very attractive village property of 105sqm living space, set on a nice planted land of 1700sqm. It comprises : living/dining room, kitchen, 3 bedrooms, bathroom, 2 wc. Full and huge basement, garage 2 cars. oil central heating, septic tank. Nice Garden. Viewing recommended. This house / villa , with a land size of 817 m² (about 0,20 acres) contains 6 rooms including 3 bedrooms, 1 bathroom and 1 toilet. It is equipped with a living room and with a garage. With south exposure this house / villa (town house) , with a land size of 40 m² (about 0,01 acres) has 8 rooms including 5 bedrooms, 1 bathroom and 1 toilet. It has dining room, a terrace and a cellar. Heating : gaz. Others : parquet floor. This house / villa (contemporary house) , with a land size of 1140 m² (about 0,28 acres) contains 7 rooms including 4 bedrooms, 1 bathroom and 1 toilet. It is equipped with a garage. This house / villa (contemporary house) , with a land size of 1980 m² (about 0,49 acres) comprises 14 rooms including 4 bedrooms, 1 bathroom and 1 toilet. It is provided with a living room, with dining room, with a garage and with a cellar. Large Modern house with loft to converted. Fenced garden of 2500 m². 2 bedrooms of 10 m² and 15 m², Study of 4 m². Bathroom with bath and washbasin, separate toilet with washbasin. ON 1ST FLOOR : With concrete floor (water supplies existing), 4 rooms of 15 m², 30 m², 30 m² and 30 m². Nice property with basement, situated at half a mile from the beach. On GF : Entrance hall, fitted kitchen of 12m², lounge room of 16m².Dining room of 27m²., office of 8m², two bedrooms of 9m². Another bedroom of 11m², shower room comprising, shower and wash-basin, separate WC. Basement : Garage, workshop, laundry room and boiler room. Oil central heating (modern boiler). A well which is connected to the WC and washing machine. Comfortable house with garden situated in a good position in the town. ON GF : Entrance hall, lounge of 30 m² with fireplace.Kitchen of 11 m² and utility room of 17 m². On 1st floor : Landing, 3 bedrooms of 12 m², 12 m² and 17 m², shower room comprising shower and washbasin,independent WC, room of 35 m² used as storage. Garage,workshop of 25 m², room of 18 m², boiler room. Great Town House Suitable as a Holiday Home. 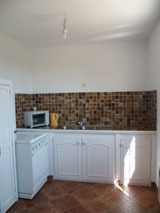 On GF: Fitted kitchen of 11 m², living / dining room of 28 m² with fireplace, study of 6 m², laundry with a shower. laundry of 8 m² with a shower, independent WC. The attic could be converted (staircase, windows existing). Large garage, boiler room. Garden and patio. Mains sewerage. Gas central heating. Between La Haye du Puits & Carentan. Modern Property with 6 Acres of Land. Comfortable 4 bedroom modern house situated in the country side with land of about 6 acres. Good aspect and nice views from this property. On basement : Garage, laundry area, 2 bedrooms of 10 m² and 14 m², WC with washbasin. On 1st level : Entrance hall, living / dining room of 30 m² with fireplace and large French door for access to a balcony, fully fitted kitchen of 30 m² open on a large terrace of 26 m², shower room comprising washbasin, shower and WC, 2 bedrooms of 12 m² and 16 m². Fosse \'toutes eaux\'. Gas central heating (new installation). Numerous outbuildings used as storage, workshop and garage. A Great Blank Canvas. Vesly. Large house to be converted inside with planning permission and 240 m² possible habitable. Water and electricity supplies, drainage system ok.
On 1st floor : Loft to be converted (120 m²), concrete floor on 1st floor with staircase. Attached to the house : garage of 42 m², « fosse toutes eaux ».